Now when you send a message by mistake, you can simply tap the retract button. This works both before or after the text has been viewed, so even if you weren't able to prevent your ex from seeing that kissy face emoticon you intended for your new significant other, you can at least strike it from the record. Similarly, you can prevent yourself from accidentally messaging something grossly inappropriate to your boss. To demonstrate this, here's a guy who probably wouldn't look out of place in an Old Spice commercial. As mentioned towards the end of the video, you can also set a timer that determines how long other people have access to certain messages and images. The content will not appear until a recipient presses down and holds onto the chat. The message will then disappear after the time limit has expired or they lift their finger up from the screen. BBM can't prevent them from taking a screenshot, but it will shoot you a notification if it detects that one has occurred. The new things don't stop there. This update makes picking stickers easier and shows what music your friends are listening to in feeds. And when someone sends you an image, you can request an HD version with more detail. Here's the change log. 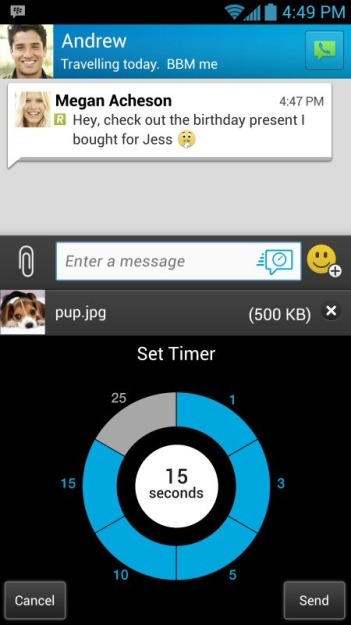 TIMED MESSAGES: Set how long contacts have access to messages and pictures shared in a chat. See the full description for more information. MESSAGE RETRACTION: ‘Retract’ a message to remove it from your BBM chat. See the full description for more information.